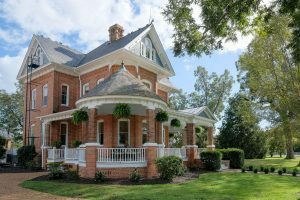 Edenton has multiple award winning B&Bs with fantastic breakfast offerings, a recognized national chain motel and good restaurants to boot. ~ Pete R.
When Cycle NC shows up, they camp in the park at the waterfront. 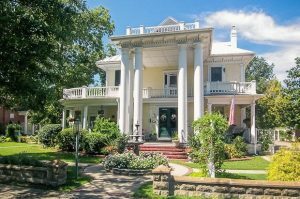 But, many visitors prefer the charm and uniqueness of our Bed and Breakfast facilities that fit so perfectly with the historic nature of Edenton. 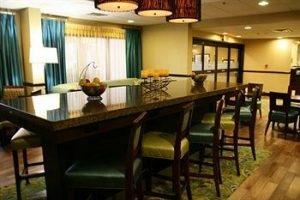 Others prefer the efficiency and modern conveniences of the Hampton Inn and other more traditional motels. For more information, specials and news about events in Edenton as well as what is happening at B&Bs, hotels, etc., follow this link. Captains Quarters is a great Edenton B&B and each room has its own unique sailing theme. 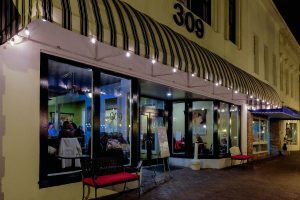 The Inn is located in the historic district of what Forbes.com called “one of the prettiest towns in America” and is within walking distance of Edenton Bay’s waterfront, historic sites and Edenton’s downtown businesses. More…. 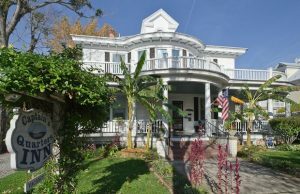 A modern southern bed & breakfast offering afternoon libations, cooking classes, weddings, events & supper club dinners. 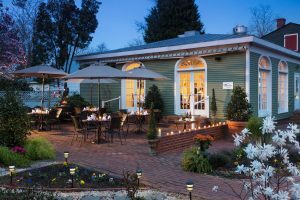 The Inn is set on 5.5-acre country setting within the quaint southern grace of Edenton, NC, and provides a restful stay or charming location for events. The Inn is a restored 1900 cotton plantation with historic buildings and gardens. Details. Granville Queen is in Edenton, NC – Stay Amid History in a Traditional Southern Neo-Classical Revival Home. Located within a stone’s throw of the majestic Chowan River and Albemarle Sound, Edenton was the first capital of the providence of North Carolina and has a water-related history going back well over 350 years. Edenton was also home to many Revolutionary patriots – as well as the haunt of the infamous pirate Blackbeard, which the folks at the Inn will happily discuss. More…. In the heart of Edenton, the Inner Banks Inn consists of three restored buildings and a famous restaurant, The Table. Rooms 1-8 are in The Proprietor’s Inn. Rooms 14-21 are in The Pack House. Rooms 22-23 are in The Tillie Bond Cottage, which is pet friendly. The Inner Banks Inn and The Table are located in the historic district, within walking distance to the waterfront and Borad Street shops. More…. 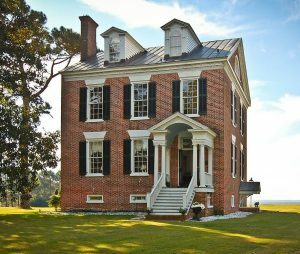 Take the opportunity to stay in a newly renovated, 18th century (1791) home on the golf course at Mulberry Hill Plantation overlooking Edenton Bay and the Albemarle Sound. Period architecture and furnishing combine with modern amenities. More importantly, the Innkeepers’s husband, Tommy, is one of Edenton’s best and most informed story tellers. Experiences with food range from neat little country eateries to fish houses and unbelievable sandwich shops. Some are only found with the advice of locals, others are nicely visible on Broad Street, the main drag through Edenton. For the most up-to-date information, see Chowan County Tourism Development Authority’s web site. The 51 House is a traditional American Restaurant located in Edenton, NC overlooking the Albemarle Sound. 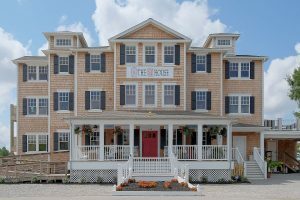 A combination of the gorgeous waterfront setting, exceptional food and hospitality makes The 51 House a destination for anyone looking for a quality time. Taking inspiration from the Edenton Tea Party and the American Revolution, The 51 House combines classic dishes with modern updates to create a menu that is sure to please. Celebrity Chef Vic Vegas – best known for his numerous appearances on the hit reality TV show Bar Rescue – has been named Executive Chef. Vegas is focused on operations and culinary options. More info on their web site. Established in 1996 and open for dinner Monday-Saturday with a menu specializing in seafood but also featuring steaks, pastas, sandwiches, salads, raw bar platters, and nightly specials. A full bar includes North Carolina craft beers, wine and cocktails. Located in a historic two-story brick building in the heart of the historic downtown and with a view of the waterfront from the upstairs dining room. Welcome to Waterman’s Grill. Chef James Ott and Chef de Cuisine Cory Hoos feature amazing seafood, steak, chicken and pork dishes with paired wines, most from local sources. Open Sundays and most days of the week for lunch or dinner, their original cuisine style, Five Corners Cuisine, highlights food techniques and cultures from the four corners of the United States plus Inner Banks offerings. When paired with the geography of our area the Ocean – River – Farm – Fusion offerings provide for the original Fifth Corner, “Inner Banks Table Cuisine.” The Table. Broad Street. Or, if you are looking for a great place for a drink, you’ve found your place at 309 Broad Street. As Executive Chef and Owner Kevin Yokley and his wife Jennifer say, “each dish is made with the finest quality seafood available, we source our products from the most reputable and respected purveyors and fisherman, locally, domestically, and sustainable whenever possible”. More…. 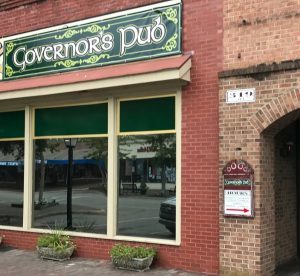 One of Edenton’s newest downtown eatery offers a broad menu and a great bar. Open longer hours and more days per week than some local restaurants. Open Monday-Saturday 11am – 11pm; Sunday 10am – 11pm. Find them at: 321 South Broad Street. Enter the brick archway, walk about 40 feet studying the murals of earlier Edenton to the restaurant’s entrance on the left. Check them out. 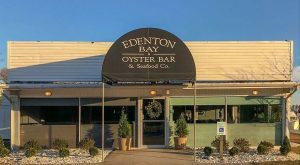 Even newer, by a month or two, is the Edenton Bay Oyster Bar, located at the Edenton Marina on West Queen Street, this new restaurant offers oysters, seafood, fish tacos, a wide variety of appetizers, steaks, and pork chops. Edenton Bay Oyster Bar & Grill is open Thursday through Sunday, 4pm to 11pm. Keep up with them via their Facebook page. Need some great crackers, cheese, craft beer or a fantastic bottle of wine to enjoy on your boat or at home? 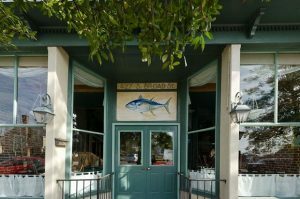 The most convenient and delicious selection will be found at Edenton Bay Trading Co, near the waterfront at 407 S Broad St. Most folks also find it nearly impossible to stop by for food without also finding a must-have gift or decorator item. Check with them about vinyl and trivia nights and other special occasions. Truly a unique find in Edenton, or anywhere for that matter. More…. Edenton Chowan Partnership, a 501(c)(3) not-for-profit organization incorporated in North Carolina. | © Edenton Chowan Partnership, Inc. All Rights Reserved.